Although the economic downturns of 2001 and 2002 have threatened to dampen enthusiasm for employee equity participation in business enterprises, such plans continue to be offered by employers in nearly all major national jurisdictions. The time is ripe, in fact, to clarify and elucidate the legal complexities of extending such plans across borders to employees working in other countries. This is the first book to provide in-depth, country-by-country coverage of the national law issues that must be considered by an employer implementing (or considering the implementation of) a multinational employee equity plan. the extent to which local courts will recognize foreign law in all pertinent matters. The wealth of guidance and information in this book will help many more organisations to follow the lead of those companies that have already achieved remarkable success in this important area of international business. 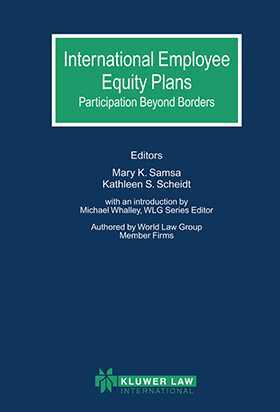 Legal practitioners, in-house counsel, human resources executives and others involved in implementing employee equity plans have here a detailed and user-friendly handbook covering the most important jurisdictions. Introduction; M. Whalley. Argentina. Australia. Austria. Belgium. Brazil. Canada (Ontario). Canada (Québec). Chile. Denmark. France. Germany. Greece. Hong Kong. India. Israel. Italy. Japan. Malaysia. Mexico. The Netherlands. Norway. Peru. Portugal. Singapore. South Africa. Spain. Sweden. Switzerland. Taiwan (Republic of China). United Kingdom. United States.